Nancy Prince is all about thread painting and thread sketching. 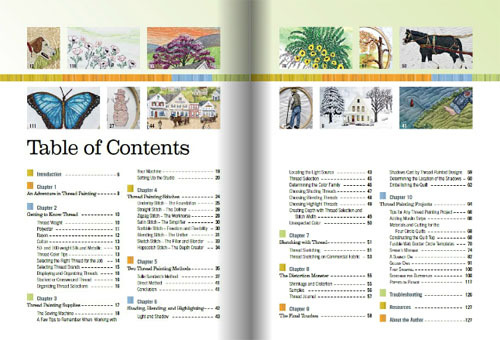 Her new book, Thread Painting with Style, is a great place to start your thread painting adventures, or to take them to the next level. To take this one step further Nancy taped an episode centered on her new book for theQuiltShow.com – Alex Anderson and Ricky Tims’ website – that will begin airing on February 13 at www.thequiltshow.com. Watch the show, spend some personal time with Nancy, and learn how to create realism in your thread-painted designs. She will walk you through selecting shading, blending, and highlighting threads for your design and you’ll be amazed at how just the proper amount of shading will transform a one-dimensional design into a three-dimensional one. She’ll also show you how to create depth and closeness in your designs just by selecting the right thread color along with proper zigzag width. Want to learn how to thread paint or sketch on the fabric in your own stash? The last section of the show is devoted to detailing just how simple, yet effective, thread painting or sketching can be on commercial or printed fabric. If you are a member of Nancy’s newsletter, you can view the show (episode 1-4) for FREE from February 19-26. Just email Nancy at nancy@nancyprince.com and she will give you the information you will need to see the show free along with a 20% off coupon code to join The Quilt Show. So come see Nancy on February 13 (or thereafter) and see what the buzz is all about! !